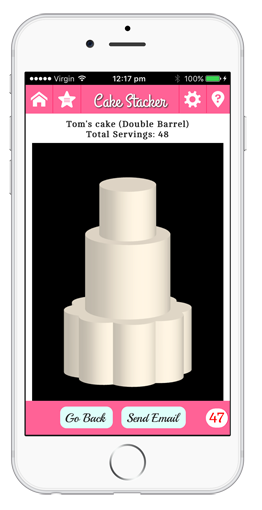 Sharing cake cutting guides with your clients is just a tap away!! Works with 10 cake shapes, 4 portion sizes and 2 slicing methods. 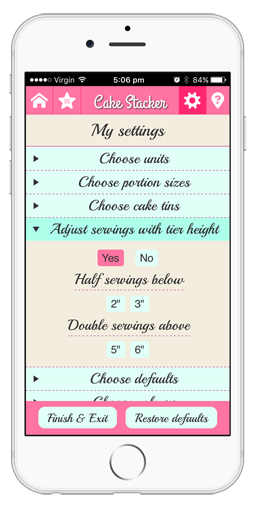 Choose from 4 Portion sizes: 1"X1", 1"X2", 1.5"X2", 2"x2"
412 cake slicing guides with slicing instructions. Choose from 2 types of slicing methods. Concentric circle and Straight line. 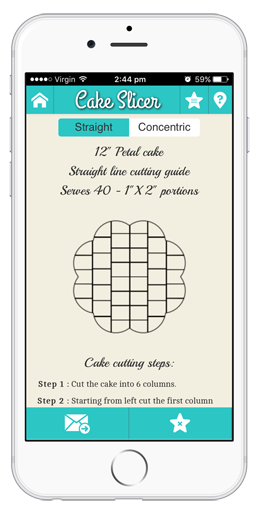 With 412 cake slicing guides loaded, Cake slicer will suggest you a visual cake slicing guide for your search. Collect 25 most used guides in "My Favourites". Save most often used guides as a favourite and rename them for ease of recall. All your favourites can be viewed from any screen by tapping the star list icon. Share a single or multiple guides by email. Sharing any guide is just a click away. Email a link to your client or yourself. Just click the email icon when viewing your guides or Just tap to select multiple guides from your favourites and share them in one email. Just click the email icon when viewing your guides or send multiple guides to a email from your favourites. 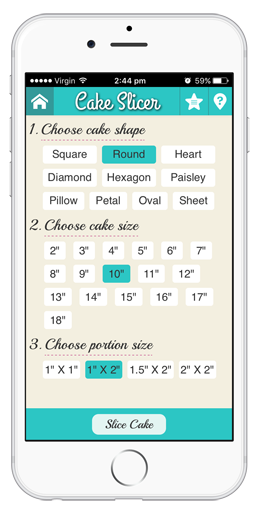 Choose from 10 cake shapes and tin sizes from 2" to 18". 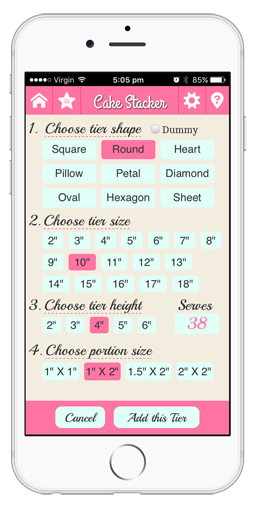 Add, edit or delete tier shape, size and height to build your desired cake. 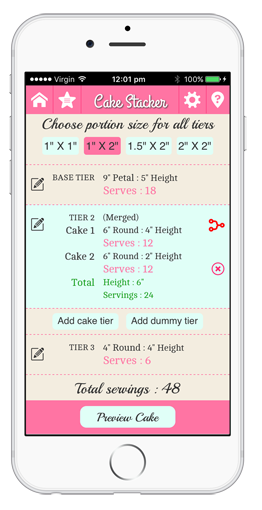 Merge tiers to make double barrel cakes, use a common portion size for the whole cake or have individual portion size for each tier. 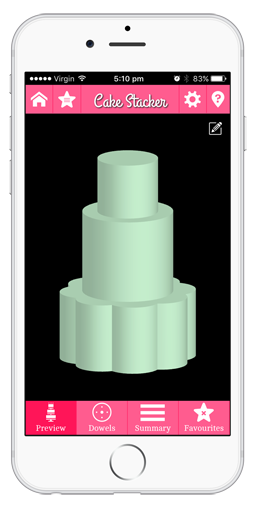 Instantly see how your cake will look like in a 3D Cake Preview. 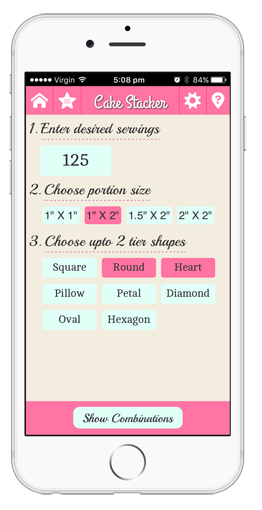 Enter your desired servings and let the app suggest possible tier combinations. 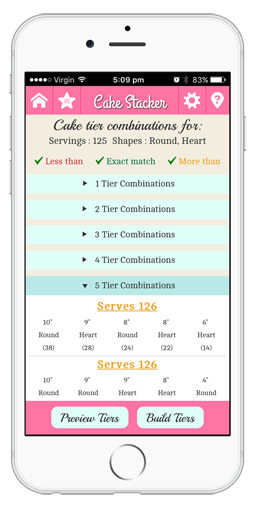 Works with multiple cake shapes and shows the closest results sorted by number of tiers. 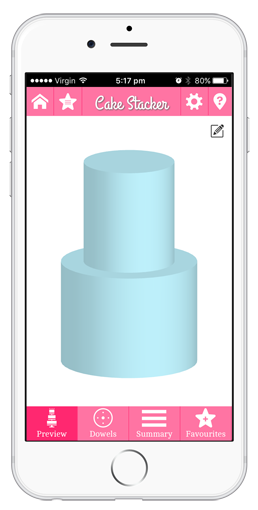 You can immediately see how your stacked tiers will look like in a 3D Cake Preview!! 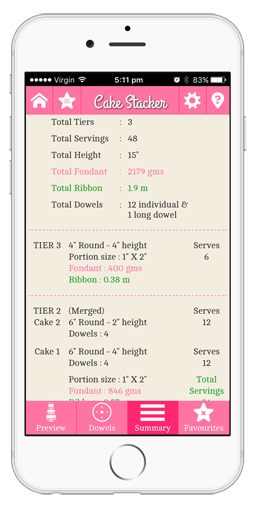 Summary shows a overview of your tiered cake with Fondant quantity and Ribbon length measurements needed for each tier. 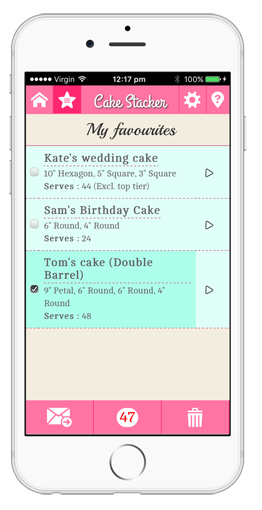 Mark up to 25 cakes as favourites, rename them and select to share with your customers. 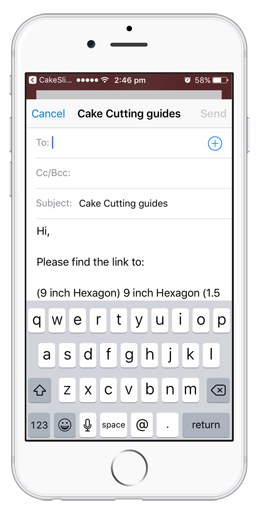 See a email preview of your selected cake, choose to include or exclude summary with the email before you send it. Works in Metric and Imperial units. 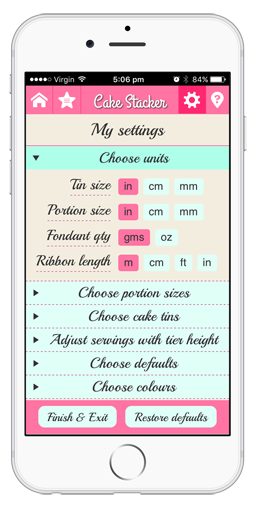 Options to choose units for tin size, portion size, fondant quantity and ribbon lengths. Adjust servings with tier height. Half or double servings from settings. 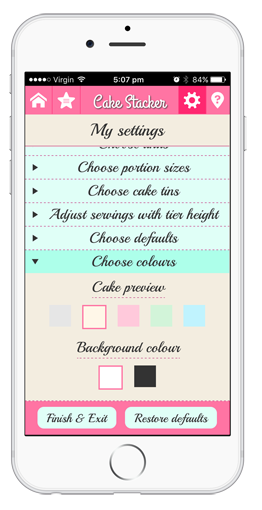 Choose from 5 beautiful pastel colours to preview your cake and add a background colour of your choice.